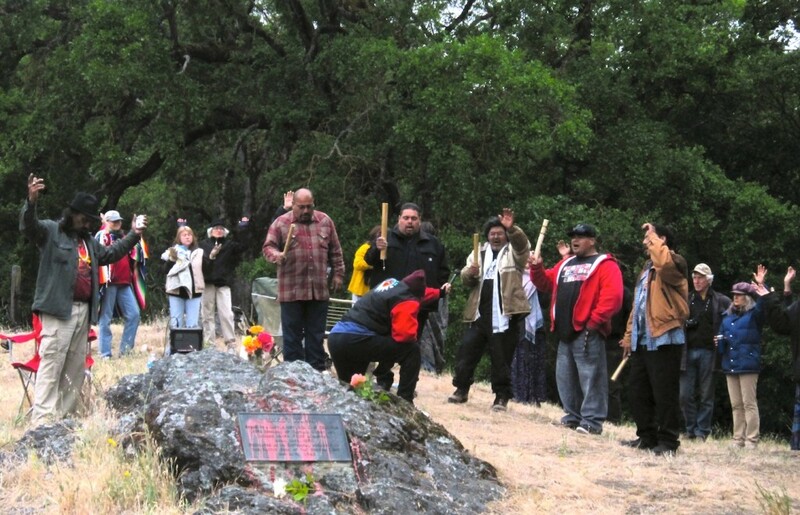 spiritual encampment at Glen Cove took part an annual memorial gathering at Clear Lake to honor the Pomo Indian people that perished, and those that survived the Bloody Island Massacre of 1850. 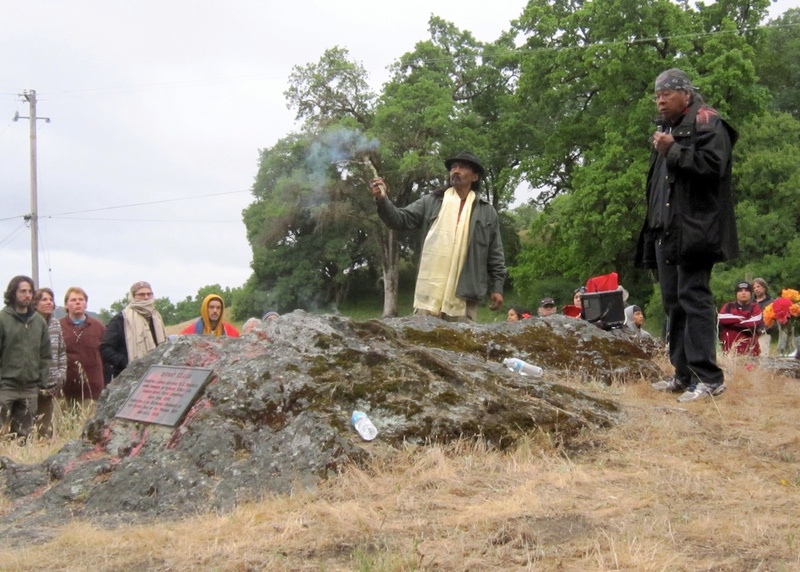 During the sunrise ceremony, Wounded Knee (Miwok), Fred Short (Ojibwa) and Dedric Thomas (Dakota) addressed the group of about 150 people, explaining the situation at Glen Cove and asking for support and prayers. 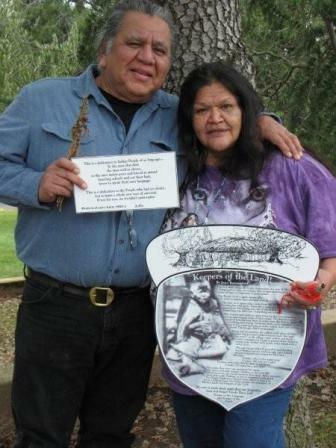 The Sogorea Te song was then sung with clappers by Mickey Gemmill Jr (Pit River), Naiche Dominguez (Apache/Ohlone) and Dedric Thomas, accompanied by Doug Duncan (Pomo). Following the ceremony and story-telling, three horses suddenly appeared in a nearby clearing, which was seen as a sign that the spirits of Bloody Island had heard our prayers. 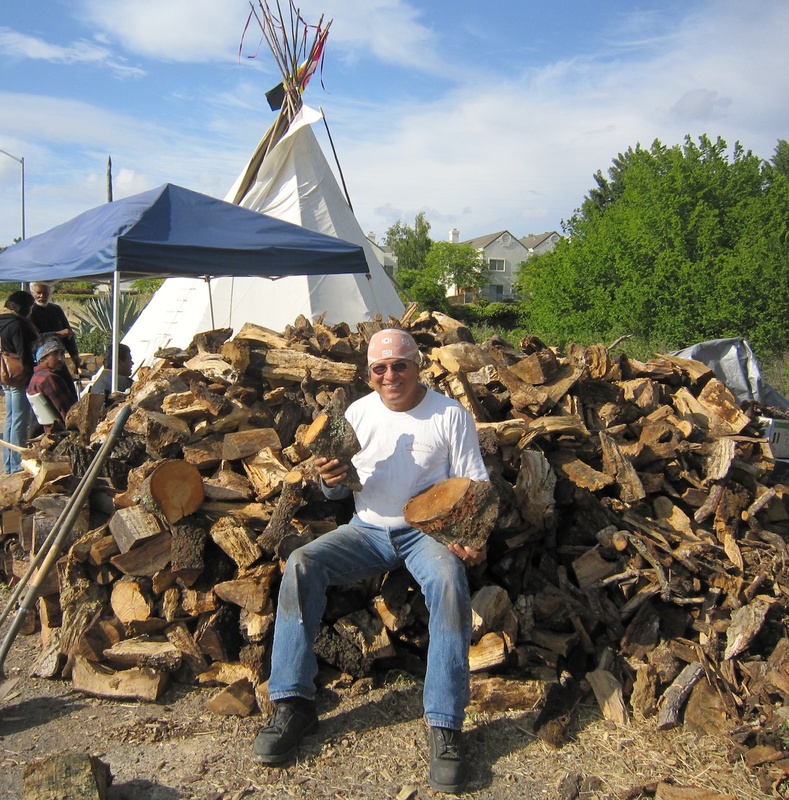 Sonoma Dave (Chiricahua Apache) brought yet another jam-packed trailer full of wood today, further reinforcing our spiritual encampment. He explained during evening circle why the hearts of many people including himself are with us in this struggle, and that though he cannot be standing beside us every day, he is contributing in all the ways that he knows how. At dusk, a light rain began to fall, lifting our spirits and bringing new life to the dry earth. The sharp click-clack of clappers and the melody of many voices singing California (Ohlone and Pit River) prayer songs filled the air. 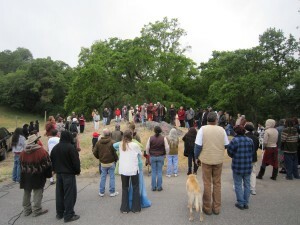 Above three photos: May 14, 2011 Bloody Island Memorial sunrise ceremony — held at Bo-no-po-ti (“Old Island” in Pomo language), now known as Bloody Island, Clear Lake, CA. Sonoma Dave and the gargantuan pile of wood that he donated today. The appearance of the three horses was a spiritual gift from higher power. That kinda thing leaves you speechless. Hang in there People of the Earth! 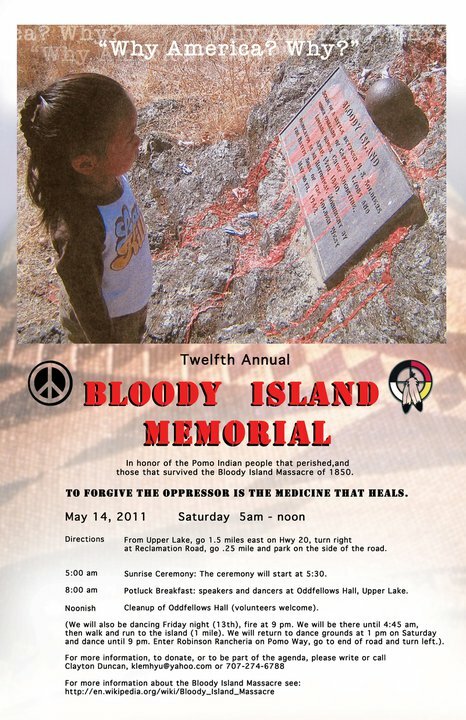 Incredible gathering of prayer, team-ship, dance, songs, regalia, love and respect for the ones who lost their lives in 1850. I was blessed with the people and smiles and prayers throughout the event. 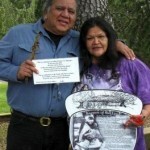 Doug’s dream came to fruition and I believe will grow outward as this ceremony keeps teaching and reaching out! keep on fighting for what you believe, especially this, i would not like it if someone told me they were going to dig up my ancestors, will be with you from afar , blessings to you all.